Sandra, in your passion for chocolate, I’ll forgive you for calling me Dorothy! Thanks for your support, and the invitation to return to your platform of authors’ profiles. I would be thrilled to talk about Chocolatour with you! Oh, i would love the job of pairing wines with these gorgeous goodies! BTW: i have been drinking reds!!!!!! and no reaction. Oh, this sounds wonderful! I wish I could indulge my love of chocolate more…. Mmmm. Thanks, Manny & Elizabeth, for your comments – and your enthusiasm! Yes, Manny. Chocolatour will have a chapter on chocolate and wine pairing. In fact, I tried a wine last that goes tremendously with chocolate as it has chocolate undertones in it. Look for Barista in the South African section. A delightful Pinotage! Giddy over chocolate? You? Never. I wonder what makes the Madagascar chocolate so special. Is it the soil? The island environment? The unique qualities of the bean? I believe a fact finding mission is in order. You got that right, Virginia! We will reinstate our chocolate-tasting partnership later this year/early next to uncover the mysteries of the amazing trinitario beans of Madagascar. It’s sure to be a very tasty trip! Okay, now you’ve got me, Doreen! Florida is really not my destination of choice (I’m not a beach person), but apparently I have to make a special trip to Fort Myers to meet Mr. Love. I suspect the Black box would be my favourite too. Yes, knowing your fine taste in chocolate, Kathe, I know you’d love the NL BLACK collection. It has the elegance and sophistication of Jean Galler’s chocolate, but with a sense of youth and playfulness. The best I have had to date. It made me sad as I worked my way thru the box, knowing that it would soon be coming to and end. I’ve never quite had such an emotional attachment to chocolate. I too have taken that delectable journey to “Norman Love” confections at Ft Myers and I relived it thru your article. It is a true mecca for the gastronomic chocoholic and I hope I was not the one taking photos when you arrived. I took the early April easter egg class and it was a pleasure to work alongside these fabulous artists. Their chocolate creations truely are a work of art and I also could not leave without purchasing deserts and pastries and chocolate. When I invited people to taste a chocolate, many of them declined initially because they are so beautiful, people were scared of taking one. But they are there to be enjoyed, after all I only live 4 hours drive away and I intend to go back for more classes. The greatest lesson I have learnt from Norman Love confections, is that next time I need to buy a bigger box of chocolates! Thanks, Lori. Nice to have you along! And, Claire. Lucky you for living just 4 hours from Norman Love’s shop. Did you know he has a new shop in Naples, FLA? We were in For Myers in January of this year, so no, I didn’t see you there in early April. Buy the biggest box you can afford! That way it will last longer and be enough to share with your chocolate-loving friends and family. I went to Fort Myers Beach when I was 8- it was my first time traveling outside Canada -and now I have good reason to go back! Sounds waaayyyy tastier now. Hi Suzanne: Nice to have you joining us on this tasty adventure. Yes, I’ve been to FLA many times, but this was my first time to Fort Myers and I can’t wait to go back. Not just for the chocolate, but for the lovely beach and great environment. I grew up in Naples, just to the south of Ft Meyers. I can only say that if Norman Love had been in business when I was a teen, I wouldn’t be living in Oregon now. I can’t tell you how sad it makes me, knowing that he won’t even ship me some of his little works of art masquerading as candy until the cold weather returns. Sniffle! Hi Jeanine: Thanks for joining us here on the blog. Yes, Norman’s chocolates only have a shelf-life of 3 weeks, so I don’t believe he ships them as you can’t guarantee quality on arrival. Only way to expedite delivery and get some of those chocolates would be to pay for UPS/Fed-ex next day delivery and that would make the cost of the already-expensive chocolates sky high! I’ll be looking to find some amazing chocolate makers in Oregon. If you have any suggestions/favourites, send them my way. Lucky you, Debbie! I can’t imagine how distracting and alluring that would be. Goodbye waistline! All the best chocolate has to be sought out and travelled to in order to experience and I envy your chocolate travels here! I can’t wait for your chocolate adventures book to come out and I know lots of us will be following in your footsteps! Thanks so much, Judith! Great to have you along on the Chocolatour. You’re right! The chocolate we get in most commercial establishments barely resembles the “good stuff.” Chocolate lovers have to get out and seek out the very best chocolate in order to really taste what chocolate is in its purest and best form. It’s my pleasure to help get the readers to the right places in their quest. Ordered the Black for my lady for V-Day, and she was transformed to another level of chocolate. I cannot wait to go down to the parlor! You’ll love Normans’s shop, Jon. The colours are just as vibrant and varied as the flavours! Sure wish I lived closer to FLA. I wonder if other authors have as much fun as you’re having researching a book? I haven’t been to this part of Florida, but if we go down next winter I’ll be sure to include a stop in Ft. Meyers and check this place out. Yes, I do have a lot of fun researching my work! Sometimes I think I should be doing something deeper (or with more meaning,) but it has always been my place to connect with people, to indulge and share stories about life and pleasure. And chocolate … certainly fits that bill. Enjoy! what a dumb time of day to read about the Black collection. Makes my breakfast seem soooo dull and my upcoming lunch even duller. Will add a visit to Norman Love’s shop when next I am visiting my snowbird sister and brother in-law. Trust me, Janie. 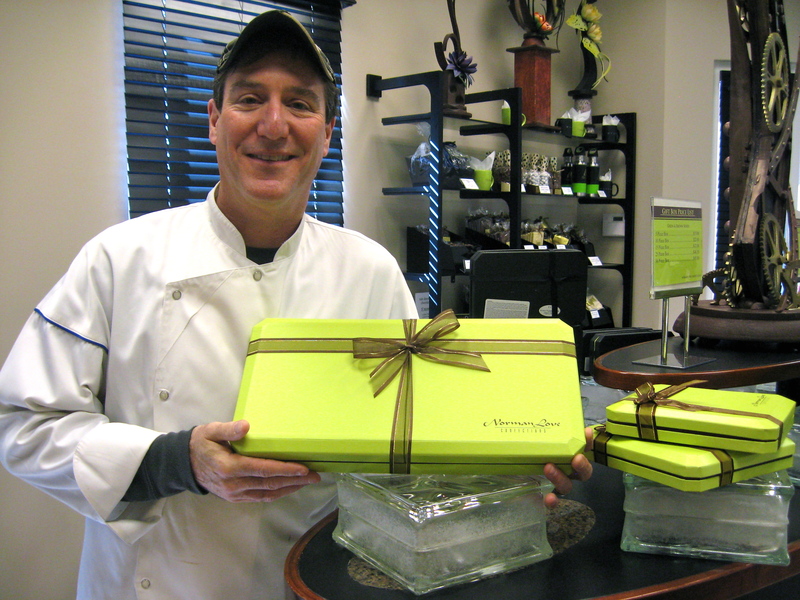 You would absolutely LOVE Norman Love’s chocolates – all of them. But the BLACK collection is the creme de la creme. The ultimate, and yes, a return trip to Fort Myers sounds very good right about now. Especially wit it being on 3 degrees c in MB right now! I’d heard of Love chocolates and I was smiling as I was reading this Doreen. It’s been a long time since that chocolate-O! 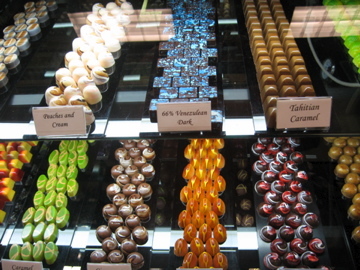 Have you tried See’s chocolates yet originating in California. Dark chocolate California brittle…mmmmmm – my favorite! Hi Dawn: It made me smile to see your comment. Yes, I remember the pics we took while eating great chocolate last year. It’s a shame you won’t be able to join us this year. I’m bringing some BRIX chocolate from the US and some fine British chocolate for us to share at the PWAC conference in Montreal. No, I have not yet had See chocolate, but I do have them bookmarked. Will definitely look them up asap. Wishing you healing thoughts and much more chocolate! If you ever get a chance to attend this annual event … GO! Lots of chocolate art, chocolate samples and chocolate artistry.